Apart from sports, Decathlon, improves its industrial logistics by installing the best of Made in Italy. Kopron is always characterised by the quality of its products and the development of high quality logistic solutions. 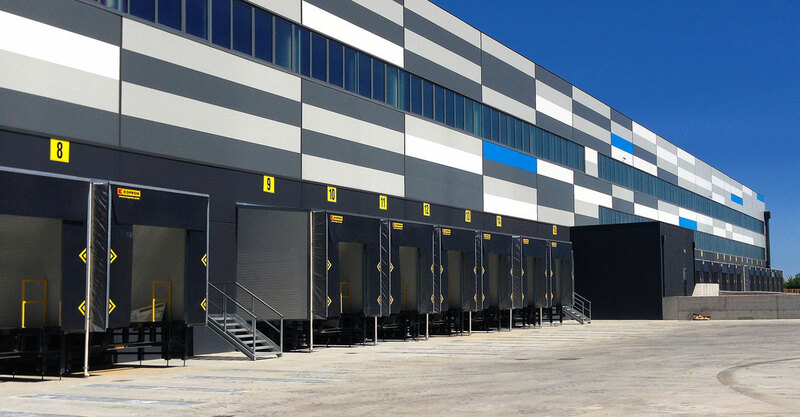 This is the case of the installation of made in Kopron loading bays in the new Decathlon logistic centre in Brandizzo, Turin: n. 28 dock houses with telescopic dock levellers, n. 33 sectional doors and n. 1 lifting platform with ground dock. The objective of these installations is to improve handling of goods in everyday loading/unloading operations. This new logistic warehouse for Decathlon is operated by Engineering Techbau and covers a total surface area of 23,500 sq. m. It supplies 25 shops in Northern Italy and is developed across two units: one mainly for picking and the other for the storage of bulky materials. The layout solution of the two mezzanine floors, will allow for process handling in a much faster, more sustainable and profitable way, also optimising the square metres used. This warehouse will also be accessible to customers who want to use the Click&Collect service, as this area will be the collection point for all orders made online. The installation of 28 isothermal dock house doors, fitted for the covering and sealing of an area with a closing door and positioned above an existing concrete and iron loading bay. This type of isothermal door consists of a supporting structure with hot galvanised steel arches that rest on the bay and are connected with one another by fixed beams that hold the extension right up o the rear of the vehicle. Finished with insulated sandwich panels. They also have a traffic light and door inter-blocking system. These dock houses have been equipped with 28 Kopron telescopic levellers with a special structure and safety system with parapets: the levellers used to compensate the difference in height and distance created between the vehicle and the warehouse floor. A “special” structure in this case has been designed for safety reasons and the desire of the customer to avoid possible accidents. Furthermore, 33 sectional doors fitted with a lowered spring have been installed, due to the type of supporting wall that did not allow for a different kind of spring, all motorised and fitted with integrated K-Vision panels. An elevated platform with ground dock was also fitted, to allow for loading/unloading of goods by vans or smaller vehicles. All of this took three weeks of work for installation, proof once again of the speed and professionalism of the Kopron team. Paolo Calvi, Kopron field manager, states with satisfaction that “The loading/unloading systems of goods allow for drastic improvement of logistics in any reality, counting on three vital postulates: energy efficiency, duration and safety”.